Former Olympic champion James DeGale has signed with promoter Eddie Hearn and will fight on the undercard of Carl Froch's rematch against George Groves at Wembley Stadium on 31 May. 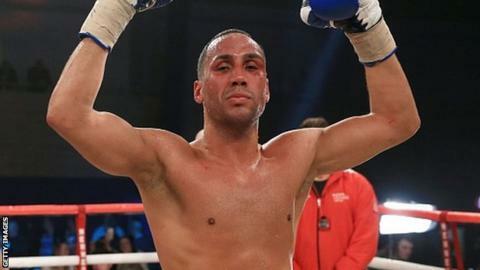 Briton DeGale, 28, will face Brandon Gonzales in a final eliminator for the IBF super-middleweight title. This could lead to a rematch with rival Groves, who beat DeGale in 2011. Promoter Mick Hennessy could sue DeGale over his decision to terminate their contract. "I'm back and I'm back big," said Londoner DeGale, who won gold at the Beijing Olympics in 2008. "The last year or so has been frustrating but that's all in the past and the future is looking extremely bright. "The fights out there for me are crazy, but I can't look past Brandon. He trains with Andre Ward and Amir Khan, so he's got great training and he's a good fighter. "I'm not fussed who wins out of Carl and George. I think Carl is an easier fight as he is made for me, but with George and I it is personal. I get angry talking about him." DeGale turned pro with promoter Frank Warren and won the British super-middleweight title in only his ninth professional fight. But after being narrowly outpointed by former amateur stable-mate Groves, DeGale joined Hennessy, who offered him a platform fighting on Channel 5. While the career of Groves went from strength to strength, culminating in the thrilling defeat by Froch last year, DeGale found himself fighting in small halls. DeGale's last fight was a 11th-round stoppage of Dutchman Gevorg Khatchikian in Bristol last month. DeGale has one defeat from 19 professional fights, with 12 knockouts, while American Gonzalez, 29, is unbeaten in 18 fights, with 10 knockouts. Hennessy, who lost Froch to Hearn's Matchroom outfit in 2011, said he was concerned that Hearn had approached DeGale. "The agreement had several years to run and we had put him into an excellent position on the world super-middleweight stage," said Hennessy. "Unfortunately the company has been given no alternative but to put the matter into the hands of its lawyers and we are currently considering our legal options against DeGale."